What is it we do, exactly? Well, we do all sorts of things because we’re interested in all sorts of things. As the official title of the group suggests, all the members share a mutual interest in sounds as relevant to language and/or speech. So, whilst most of us might find it fascinating that acoustic analyses can help perfect coffee bean roasting automation processes (check this out if intrigued), that’s not quite what we meet to talk about because that’s not something that’s related to language and/or speech. Let me try and explain what we’re all about by describing what we’ve been up to in 2018. About one week before each of the teaching semesters started, Míša emailed everyone on our mailing list with a link to a doodle poll to find out what the best time slot for our meetings would be. In approximately the second teaching week in the teaching semester we held an organisation meeting. This meeting is important, because that’s when we decide how frequently we want to meet in the current semester and what exactly we want to do in that semester. That determines most of what we’re going to end up doing for the next 5 months or so. Ditte and Hannah giving a talk. So far, most of the times we’ve been having talks – real talks and mock talks. Let’s say that you’re working on a project and the project is done and over, and you’d just love to share your results with someone who cares (we care!). You can then say during the organisation meeting that you’d love to give a talk in week X. I must admit, occasionally it’s the supervisor or the co-ordinators of the group that give you a push to do something like this, but this is done in the most loving way and no one has complained thus far :o) But it’s not just when some part of your project is done and over that you might want to present what you’ve been up to. I’d say that people have mostly benefited from giving talks about half-baked and half-roasted projects. 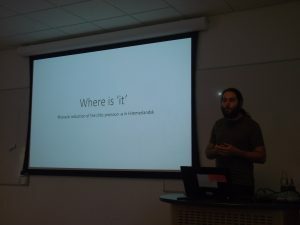 The main point of giving talks, of whatever kind, is for us to get to see what other people in our area(s) are interested in and why, get inspired, and help them out if they want us to and if we can. It’s certainly not just the student members who benefit from giving talks themselves but also us academic staff. It’s always very refreshing to look up from the tree you’ve been examining for ages and tell the rest of the world (or even a minute part of the world) what it is about the tree that bothers you or fascinates you. And then we tend to invite over people who happen to visit Aarhus and make them give a talk. Again, in the most loving and warm way. And that’s always incredibly exciting for everyone involved because that brings in a lot of fresh air. But we do more than just talk. Well, sometimes. We also encourage discussing papers in the group (and that means that all of us also have to read the same thing for a change). In 2018 we’ve met to discuss papers related to the phonemic status of Old English fricatives, usage-based grammar, and 50 years of VOT. Søren and Birgitte with the audiometer. It’s my impression that many of the members have appreciated an increasing amount of workshops we’ve been lucky to be able to hold this year. For instance, we invited Stefano Coretta over to give a workshop (and a talk of course) on Generalised Additive Models for those of us who’ve been in need of visualising and analysing curvilinear data (e.g. intonation contours, changes in voice quality and changes in vowel formants as we move gradually from the beginning to the end of the vowel). We also held a workshop on Gentle introduction to graphs in R and a two-day workshop on New Methods in Phonetics and Phonology. 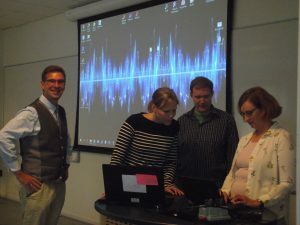 The two-day workshop focused on using the ultrasound, electropalatography, e-prime, and Alvin in phonetics and phonology, and involved specialists coming over to share their expertise with us. We hope that we can continue being active workshopwise even in the years to come. 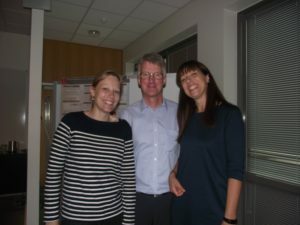 We’ve also been lucky in expanding the tools of the Phonetics Lab based at the Department of English, and so occasionally we have held sessions related to some of the new equipment, such as the audiometer. I should also say that we have been helping each other out when we need to recruit participants for experiments – expanding social networks on a regular basis. Oliver, Anna, Søren, and Anne at the ‘Phonetics and Phonology in Denmark’ conference. We’ve also organised a conference, aimed to unite the phoneticians and the phonologists of Denmark. 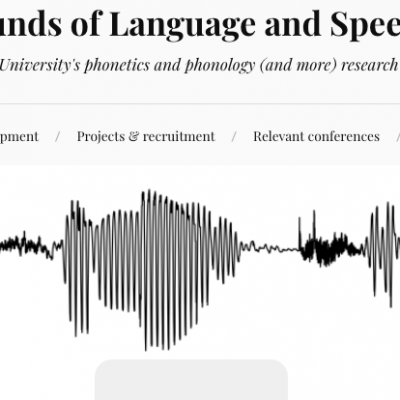 You can read more about the Phonetics and Phonology in Denmark conference here. 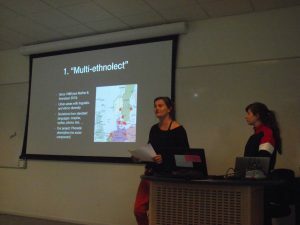 Phonners from various places in Denmark came together to share their interests and knowledge, and one of the student presenters (Krestina) won the prize for the best student presentation. Importantly though, I’d say that however beneficial all these events may have been, it’s equally beneficial for us to simply know that there are other individuals like us and that we can share our passions and worries, joys and frustrations, and encourage each other academically and otherwise. We’re not just a research group – we’re a phon-family. 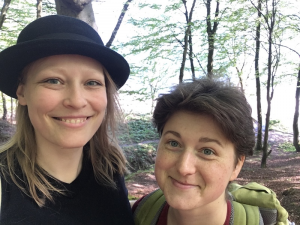 Mette and Sidsel solving some of the phonetic and phonological wonders and mysteries. A phon family may sound very nice, but who are we, really? I’ve just checked our mailing list and realised there are officially 38 members. I’m not even sure of the department affiliation for some of them – because the department affiliation isn’t important for us. The 38 members include BA students, MA students, PhD students, postdoctoral researchers, lecturers, and visiting academics (so the family metaphor is actually quite fitting even in terms of academic age). I’m a strong believer in the usefulness of this BA-MA-PhD-post-PhD mingle. As a BA student member, you can see if phonetics and phonology is something for you – what do the “grown-ups” do? Is that something you’d like to do? The same applies to MA student members as well. And actually to everyone involved, irrespective of the academic generation. Just remember, when at some point in your teen-hood you thought, “I’m sure I’ll understand one day when I’m grown up” and then, after becoming a grown-up, coming to terms with the fact that grown-ups don’t know everything and can’t know everything that there is to know, because no one ever can. So… BA members get hopefully useful advice from other BA members, MA members, etc. Needless to say, as an MA student you can use the meetings to figure out if you’d like to continue with a PhD and test your ideas for a project with us. Depending on what concerns you may have, you can ask all the stupid and not so stupid questions in a very friendly environment (Did I mention we take turns in who brings cake for everyone else?). Do the lecturers get anything out of this? Of course! First of all, it’s incredibly energising to see enthusiastic students. That in itself is rewarding enough (that’s why many of us ended up doing what we’re doing!). But, perhaps in a selfish way, we also hope to make students excited about what we do, in a way that may make them decide to work on phenomena that make our hearts beat. 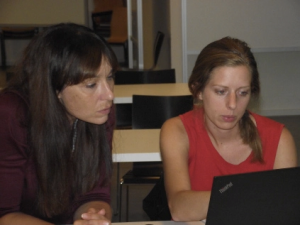 Anna and Míša, the co-ordinators of the research group. If you’d like to become a member, there are two things you should do. Firstly, email Míša Hejná (misa.hejna@cc.au.dk) and tell her to add you to the mailing list. This way you’ll start receiving updates (sent on a weekly or a fortnightly basis). Next, write a short blurb about your interests and send it to Anna Jespersen (anna.jespersen@cc.au.dk), together with a photo. Are you taken aback by having to write a blurb and email us your photo? Not to worry – here’s some inspiration coming from some of the existing members. It’s a small price to pay for lots of phonetics and phonology – we want to know who you are too! How active are the members? That depends. Some of us go to all of the meetings. Some members just like to get informed and hardly ever show up for practical and other reasons – I call these corresponding members. The photo below can serve as evidence of us being perfectly fine and happy to have primarily corresponding members amongst us too. And then there’s also variation in how active or passive we are during the meetings themselves. If you want to come along and stay quiet the whole time, that’s absolutely fine. If you want to give talks and contribute to discussions, then yay. We could write a decent book about those. If you want to find out, look at our webpage and/or come to our meetings. The different members cover fields as varied as the phonetics-phonology interface, phonological theory, phonetic theory, sociophonetics, articulatory phonetics, acoustic phonetics, speech perception, language acquisition and bilingualism, foreign-accented speech, typology, the phonetics and prosody of naturally occurring interaction, forensic phonetics, language variation and change, sound change… and more. Our interests and projects are determined by the academic interests of the members, and we are a family with many different academic personalities. Because we’re having a great deal of fun together. And we’re a bit nerdy. And that’s ok.
Míša Hejná is Assistant Professor at the Department of English. Her research interests lie primarily in the areas of phonetics, phonology, and language variation and change. She’s very much interested in motivations behind sound change, phonetic precursors of the sound patterns of languages, and mechanical biases behind such patterns.